Police release photos of suspect in fatal Charleston church shooting | Crime Stoppers of the Lowcountry: 554-1111 | 1-888-CRIME-SC | Anonymous tips earn cash rewards with Crime Stoppers of the Lowcountry. 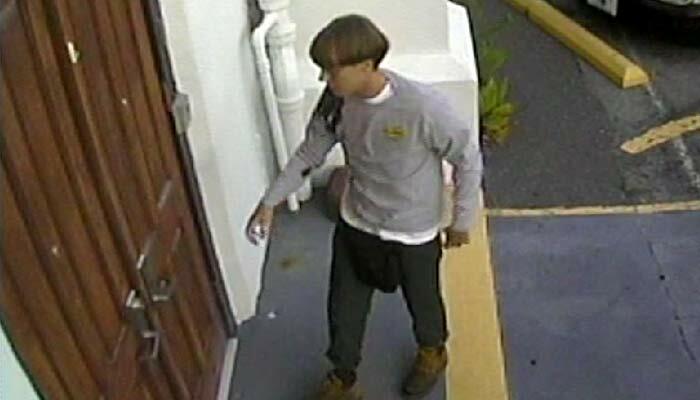 CHARLESTON, SC (WCSC) - Charleston Police have released photos of the suspect accused of fatally shooting nine people at Emanuel AEM Church in downtown Charleston Wednesday night. Police Chief Greg Mullen released a photo during a 6 a.m. news conference of the suspect, along with a vehicle used by the suspect following the fatal shooting. Mullen says the photo was captured by a surveillance camera. The suspect is described as a white male, 21 years old with a bowl cut haircut, slender/small build, grey sweat shirt, blue jeans and clean shaven. The suspect is considered armed and dangerous. Mullen will be joined by Mayor Joseph P. Riley for another news conference at 7 a.m. at the Charleston Maritime Center, located at 10 Wharfside Drive. Police were called to Emanuel AME Church on Calhoun Street Wednesday at 9:05 p.m. following reports of a shooting. Chief Mullen said officers arrived to find eight people dead inside the church. A ninth victim was later pronounced dead at a local hospital. According to officials, the shooting occurred during a prayer meeting at the church. If you have any information on this fatal shooting, call Crime Stoppers at 843-554-1111.